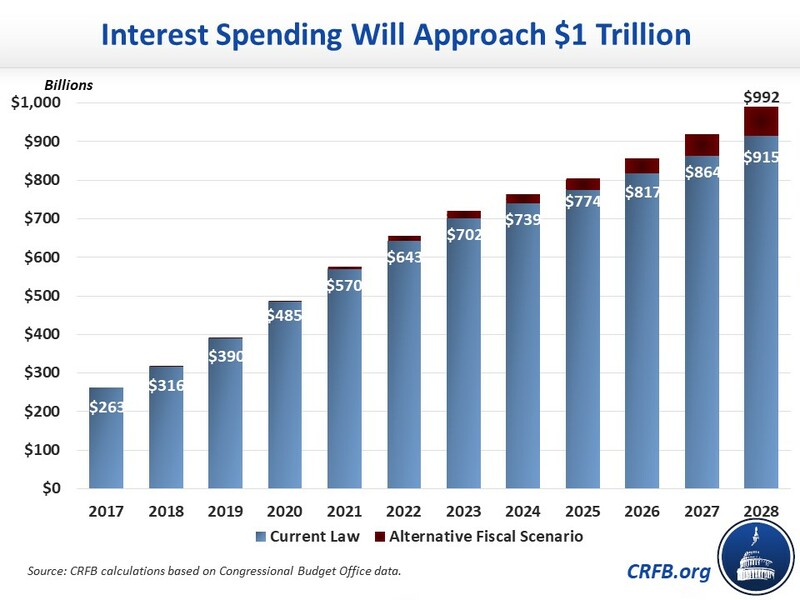 Interest spending will more than triple between 2017 and 2028 and could approach $1 trillion in just a decade. That would be a new record, as a share of GDP. Interest is the fastest growing part of the federal budget. Interest spending will exceed Medicaid costs by 2020, defense by 2023, and all non-defense discretionary spending by 2025. If interest rates rise 1 point higher than projected, it will cost an extra $1.9 trillion over ten years. In 2017, the federal government spent $263 billion, or 1.4 percent of Gross Domestic Product (GDP), servicing our debt. CBO projects that these costs will more than triple in dollar terms to $915 billion (and more than double as a share of the economy to 3.1 percent of GDP) by 2028 under current law. If policymakers extend a variety of expiring tax cuts and spending hikes – as CBO assumes in their Alternative Fiscal Scenario – interest costs would almost quadruple to $992 billion by 2028. At 3.3 percent of GDP, that amount would be the most the federal government has ever spent on interest as a share of the economy in U.S. history. 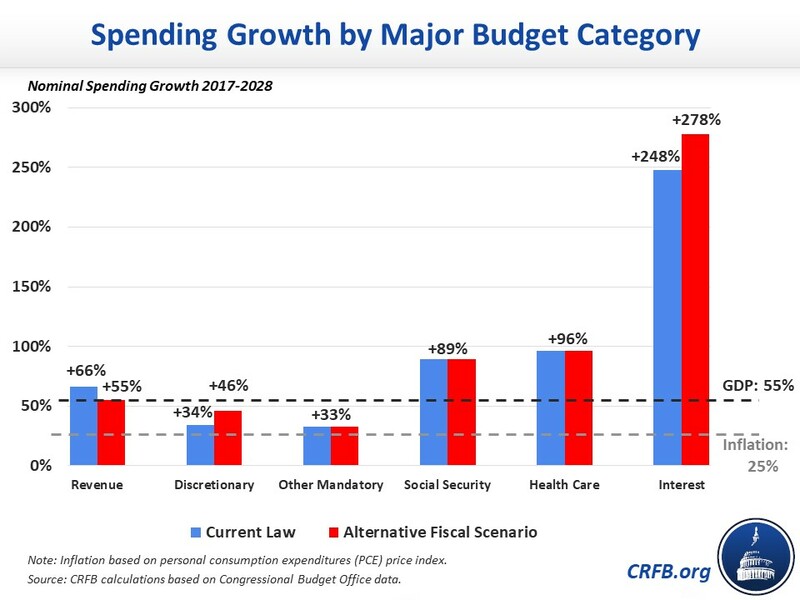 The rapid projected growth in interest spending is far in excess of the growth CBO expects from any other part of the budget. CBO estimates interest costs will grow by 248 percent between 2017 and 2028 (278 percent in the alternative fiscal scenario), whereas prices (as measured by the personal consumption expenditures price index) will grow by 25 percent and GDP by 55 percent over that period. For frame of reference, Social Security and health care - the two largest categories of spending - will grow by 89 percent and 96 percent, respectively, through 2028. Discretionary spending, meanwhile, will grow by 34 percent (46 percent under the alternative fiscal scenario); and revenue will grow by 66 percent. As a result of this rapid growth, interest will consume an increasing share of the budget over time. By 2020 the federal government will spend more on interest payments than on Medicaid, and by 2023 it will spend more on interest than on defense. Two years later, in 2025, the federal government will spend more on interest than on all non-defense discretionary spending. Rising interest costs are the result both of rising interest rates and of growing levels of debt. As we've shown above, if debt grows faster, then interest rates will as well. Under CBO's Alternative Fiscal Scenario, interest costs in 2028 will total $992 billion rather than $915 billion. If policymakers cancel certain scheduled tax hikes in addition to extending expiring tax cuts, interest costs could pass the trillion-dollar mark. Alternatively, higher interest rates could boost interest spending. CBO projects the interest rate on three-month Treasury bills to settle around 2.7 percent in 2028 – 1.2 points below the average of the 90s and 2000s; and they expect the ten-year bond to settle in around 3.7 percent – 1.9 points below the average of the 90s and 2000s. If interest rates end up just 1 percentage point higher than projected, interest costs would increase by an additional $1.9 trillion over the next decade, with annual interest costs reaching $1.2 trillion in 2028 alone. That added cost would increase debt to 103 percent of GDP under current law. The federal government is spending substantial and increasing amounts of money financing past debt-financed consumption, rather than spending on current needs and future investments. Reducing the debt would alleviate this burden.